If your User ID appears to contain the letter “O” or “L”, substitute the number 0 (zero) or 1 (one) in its place and try again. If you cannot remember your password, click Forgot Your Password to reset your password. After an unsuccessful attempt at signing in, a number challenge field is added to ensure that an automated program is not attempting to sign in. Automated programs cannot read the numbers you see in the box. If no image appears, ensure that images are not blocked and refresh your browser. If you have difficulty seeing the numbers, click the Listen to Numbers link to hear an audio rendering of the number. Note: This option requires that your computer supports MP3 audio files. If you are still unable to sign in, contact LexisNexis® Customer Support at 1-866-277-8407. See the bigger picture in precise detail. Connect to Industry-proven Intelligence for stronger AML compliance. LexisNexis® AML Insight™ delivers a comprehensive collection of specialized searches and reports to help your Financial Crime Compliance investigators find, identify and assess risk relevant information and make well documented decisions. We provide you with the intelligence and analytics that you need to protect and grow your organization. Comply, protect and capitalize with LexisNexis® AML Insight™. InstantID® - Prevent fraud and identity theft before they strike your organization. 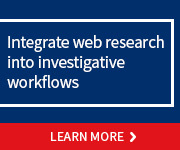 LexisNexis® Red Flags Rule Report - Streamline investigations and perform due diligence research. FraudPoint® - Assess customer risk and manage compliance regulations. Risk Solutions - Learn about our robust solution set for Financial Services. For more information about our solutions call (800) 869-0751 or email us now.